After serving more than 50 million in-flight internet sessions over the past five years, Gogo, the global leader of inflight connectivity, has gained a unique understanding of connected travelers. With that insight, the company recently saw an opportunity to enhance the experience of paying for its services. We know from experience that the integration process can often prove to be difficult. Amazon Pay was easy to integrate into our purchase path, and Amazon was over the top with support. 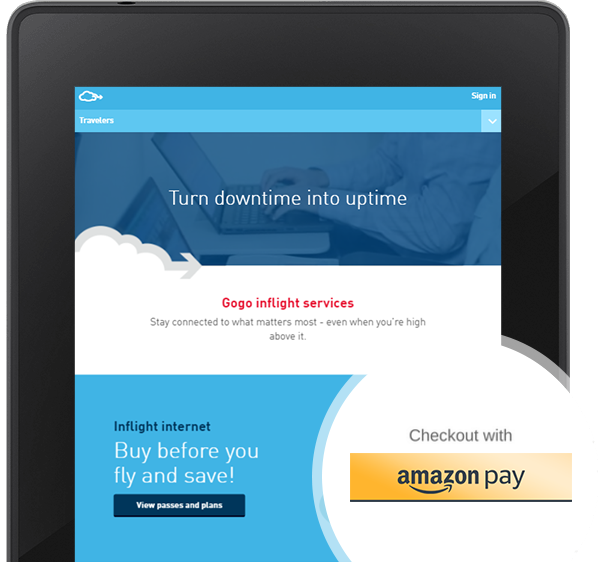 As Gogo looked for a way to provide additional options for payment, they were attracted to Amazon’s large base of millions of active user accounts. That broad reach - and the implicit consumer trust in the Amazon brand - made Amazon Pay the right solution for an easier checkout. We’ve seen improvements in conversion rates and increases in business because of Amazon Pay. The Gogo and Amazon teams worked hand-in-hand to get the project done in record time, participating together in daily status and review meetings. “We received an excellent level of testing support as we got ready to launch, which was no small feat given the complexity of our test and production environments,” continued ElDifrawi.